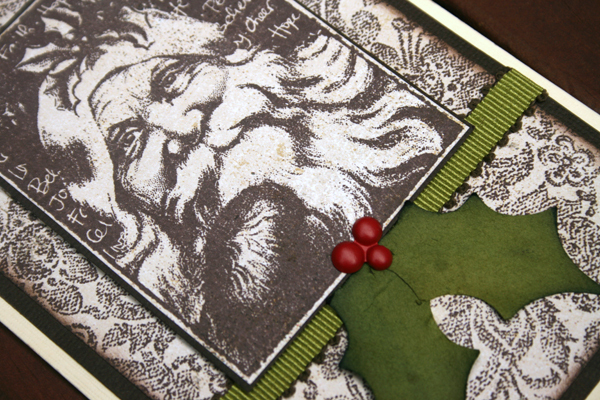 My Creative Existence: Last minute Christmas card ideas! I made these cards last year, but have not yet shared them on my blog. Better share them now before Christmas is over and done with for another year! LOL! 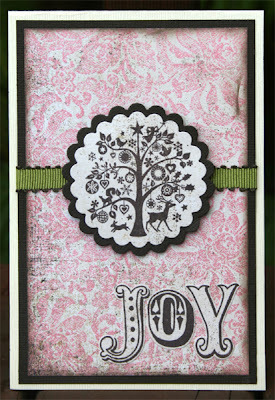 The background is the Darkroom Door Floral Background stamp, stamped in brown ink on cream cardstock. 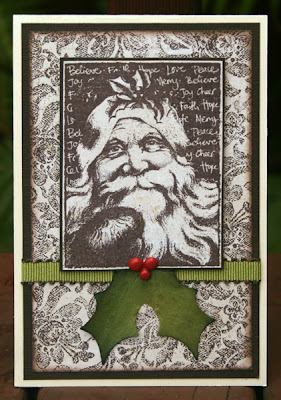 The santa image comes from the "Yuletide Vol 2" stamp set. A bit of green grosgrain ribbon, and a Making Memories Holly brighten up the card. Again I've used the Floral Background stamp, this time with pearlescent pink ink. The tree branches were stamped straight over the background in green ink. The hanging decoration was stamped on a separate piece of paper, cut out, and adhered to the card. The detail in that hanging decoration stamp is so beautiful! And you've just gotta love that Santa image! 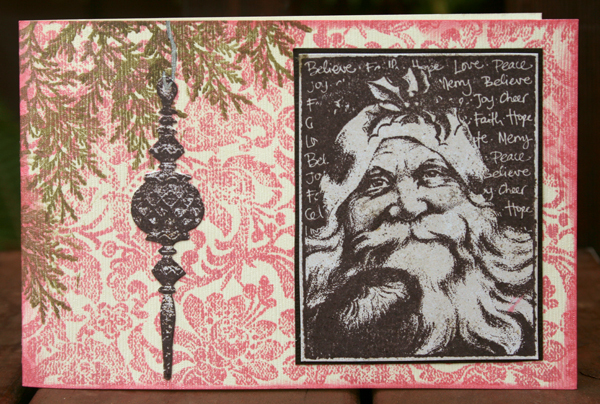 For this card I mixed things up a little and used stamps from a few different brands. 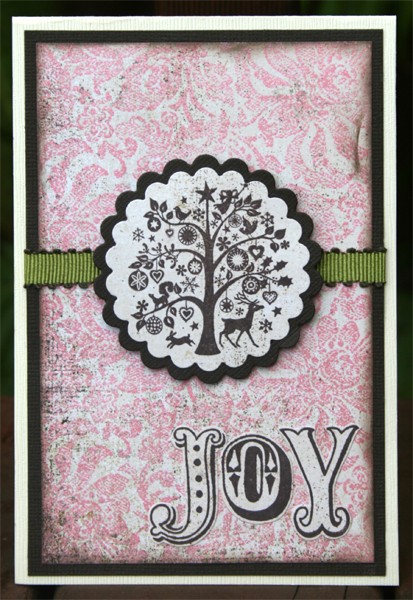 The background is of course the DD Floral Background stamp, the tree image is from Crafty Individuals, and the word "Joy" is from Stampendous. I stamped the tree stamp onto cream coloured basic grey patterned paper, and then cut it out using a scalloped circle Nestabilities die. 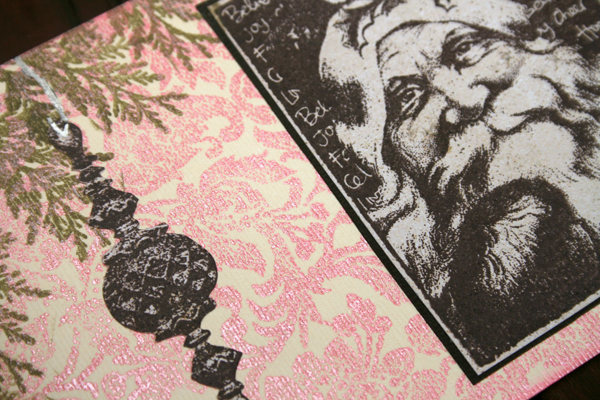 The letters in joy were stamped on the same paper, then individually cut out and adhered to the card front. Again, a bit of green grosgrain ribbon brightens up the card. Not long now until Santa comes! I'm really looking forward to Christmas - and the kids are just about beside themselves with excitement! Beautiful cards!! !Have a Merry Christmas!! Sending warm wishes to you and your family for a wonderful Christmas and much health and happiness for 2011.
these are both stunning! I adore that Santa's face - beautiful image. Wishing you a Merry Christmas! I hope you have a wonderful holiday! Looking forward to seeing more of your gorgeous creations in 2011! Lovely cards! I saw the card you sent Godelieve on her blog...have a question...looks like you used three ornament stamps, and the Darkroom Door Yuletide set has only two ornaments. Can you tell me what you used or the third ornament stamp? FABULOUS card! !